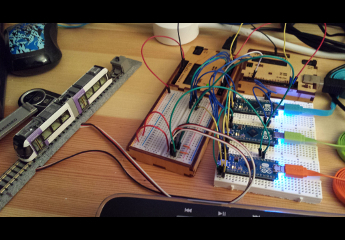 I’ve added a new page, Throttles – Implementation, which describes the current implementation of my now-working Arduino-based model train throttle system. This system was successfully used for the first time at the 2017 Ekoji Obon Festival, an annual event held each July at the Ekoji Buddhist Temple in Fairfax Station, Virginia. Our club, Japan Rail Modelers of Washington DC, has set up a display of our Japanese train models at this Festival for several years now. This year’s display included a double-track loop with a pair of my N-gauge PORTRAM models, and powered by my new throttle system. Festival visitors, especially kids, had the opportunity to drive the trams using a control lever modeled after the actual hand controls used by the drivers on the Toyama Light Rail system. There’s more information on Toyama Light Rail and my models on my Overview page.